‘It is the sort of fell that is sometimes climbed, but rarely twice. It is unfortunate in having Mellbreak as a neighbour. 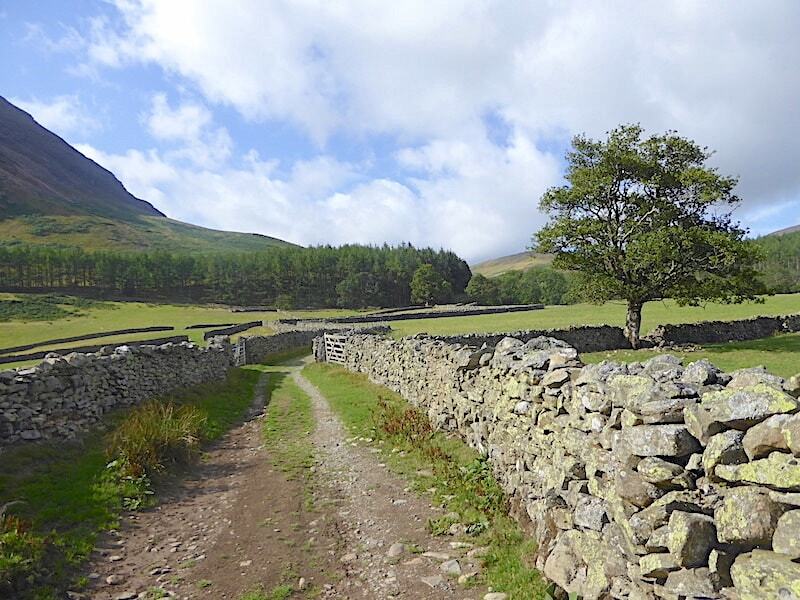 Not an exciting walk but pleasant enough on a sunny day for anybody who doesn’t want to get excited’ – AW. AW obviously didn’t get over-excited about Hen Comb either since he only gave it four pages, most of which are filled with drawings and maps, in his guide book. 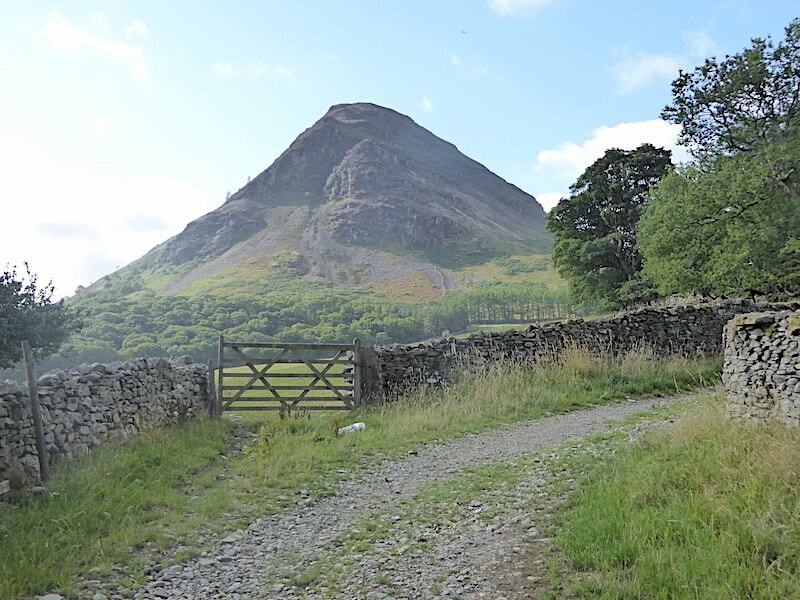 Well, we weren’t looking for excitement today, our last two walks have provided plenty of that, we simply wanted a short, quiet and relatively undemanding walk. The forecast was favourable so not having climbed Hen Comb since 2009 we thought that it would be a good choice for the forecasted sunny day. 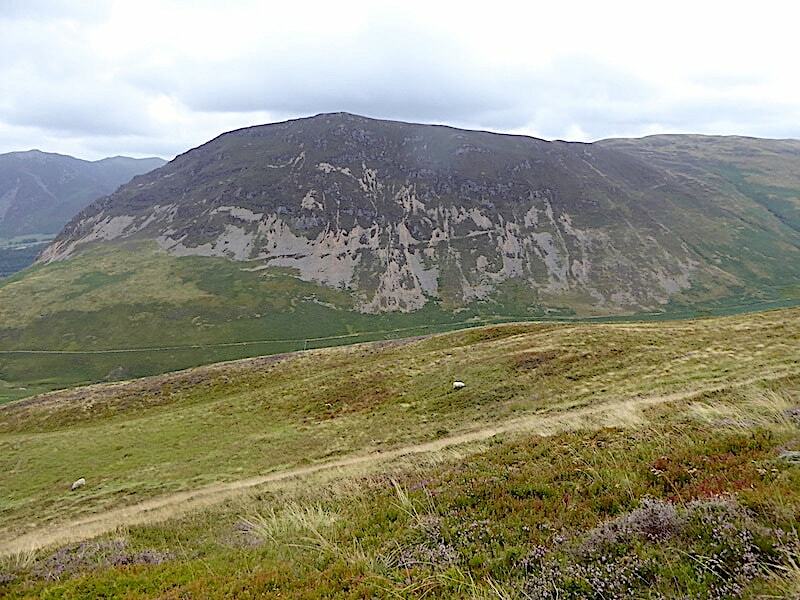 Although we started out in sunny weather we had barely got going over Hen Comb when grey and overcast skies were swept in on a strong wind, the sunny weather disappeared and things turned decidedly chilly. The face mopping towel was definitely superfluous to requirements today. 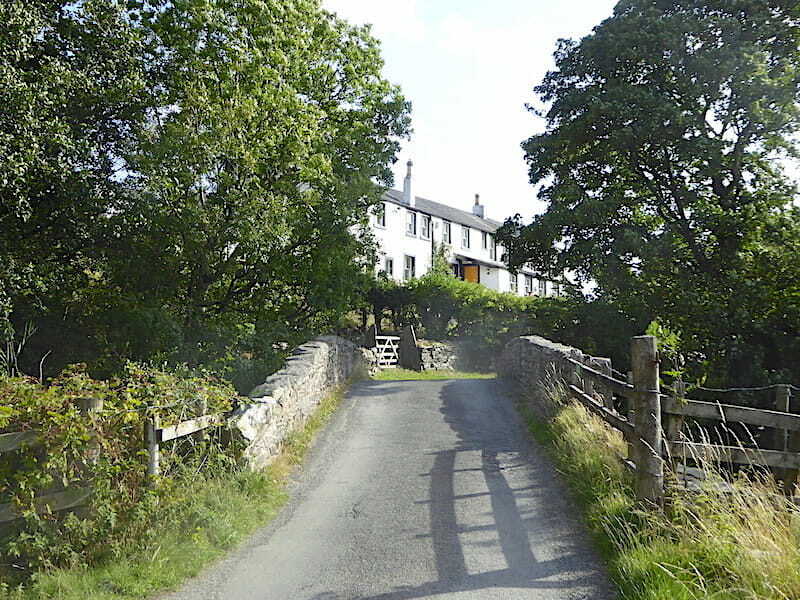 A bright sunny morning as we park up at the little parking area just across Church Bridge from where I took a look back at the Kirkstile Inn. Ours was the first car to arrive but as we were kitting up we were soon joined by two more. One of the drivers set off on his walk before we did and the other driver was still getting himself organised as we set off up the farm track. In front of us is Mellbreak, looking very much like every primary school child’s drawing of a mountain. Even though it was very windy we had a lovely sunny stroll along the walled farm track. There’s no sign of either of the walkers who parked alongside us back at Church Bridge. 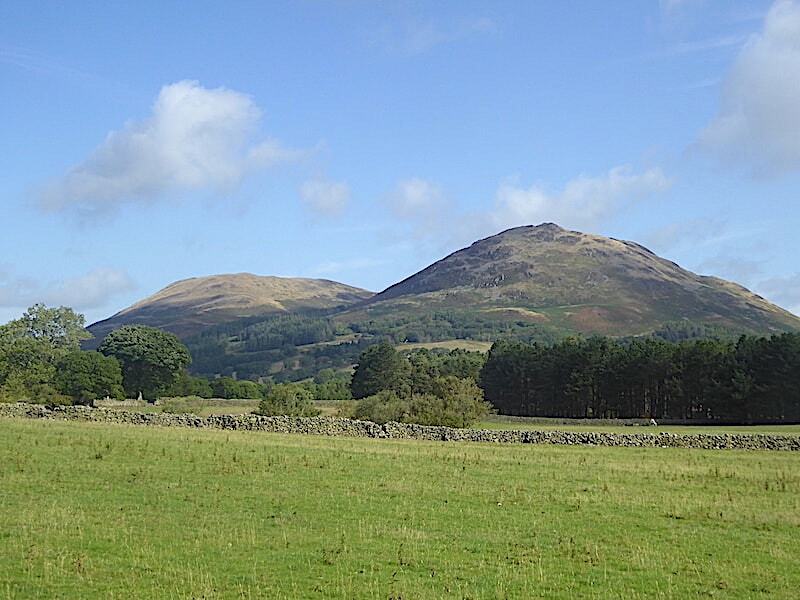 Sunshine aplenty on Low Fell and Darling Fell across the fields. 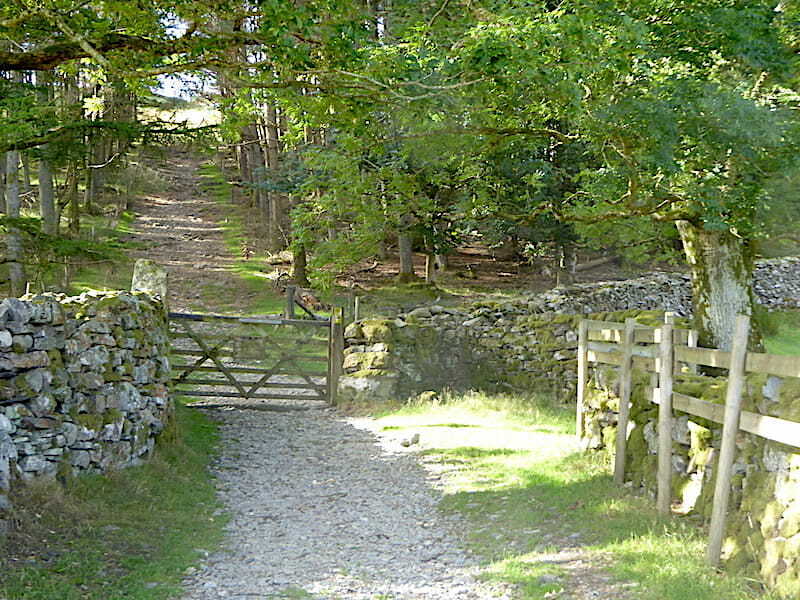 Arriving at the gate at the end of the track, once through the gate we’ll bear right on the path leading into Mosedale. The path straight ahead leads over towards Mellbreak. 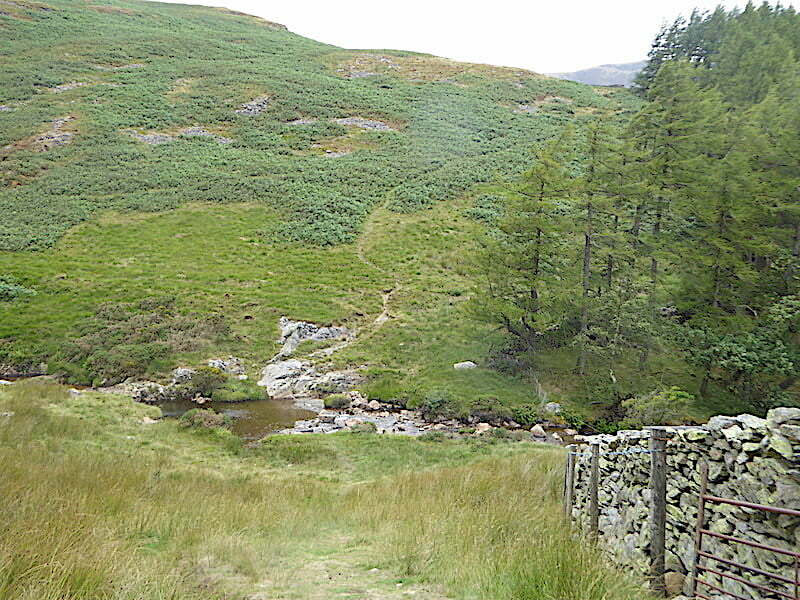 We leave the Mosedale path and bear off to the right alongside the wall and drop down to cross Mosedale Beck. 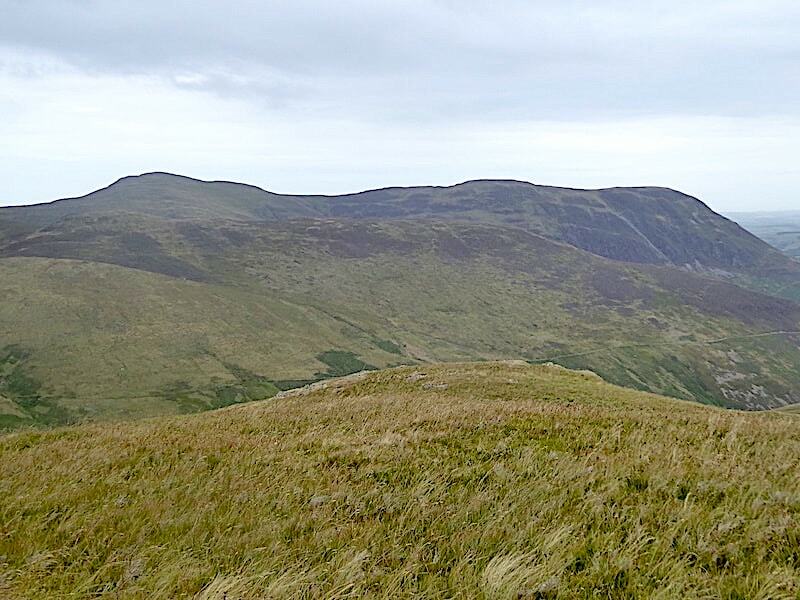 Ahead of us is the long ridge of Hen Comb, the first little bump is the rocky knuckle of Little Dodd with the summit of Hen Comb on the left at the far end of the ridge. 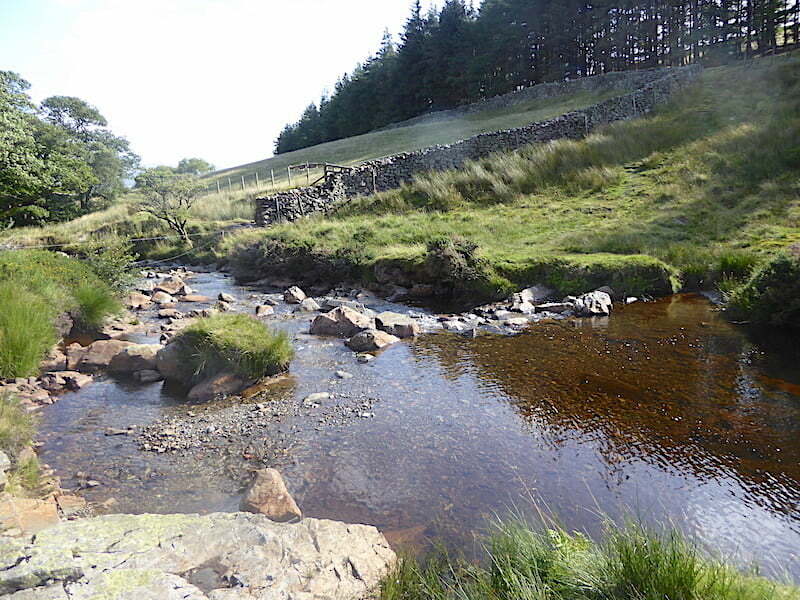 Even with the recent rainfall the beck isn’t overflowing the stepping stones and we have a trouble free crossing. Having climbed the rise from the beck we follow a gently rising quad bike track and make our way over towards Little Dodd. 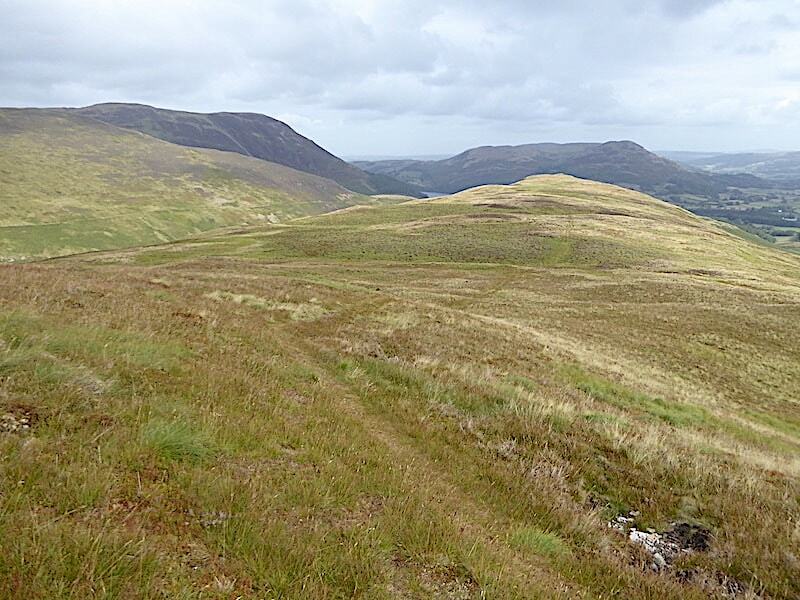 Looking back as we reach the crest of the rise for this view of a sunny Darling Fell and Low Fell. 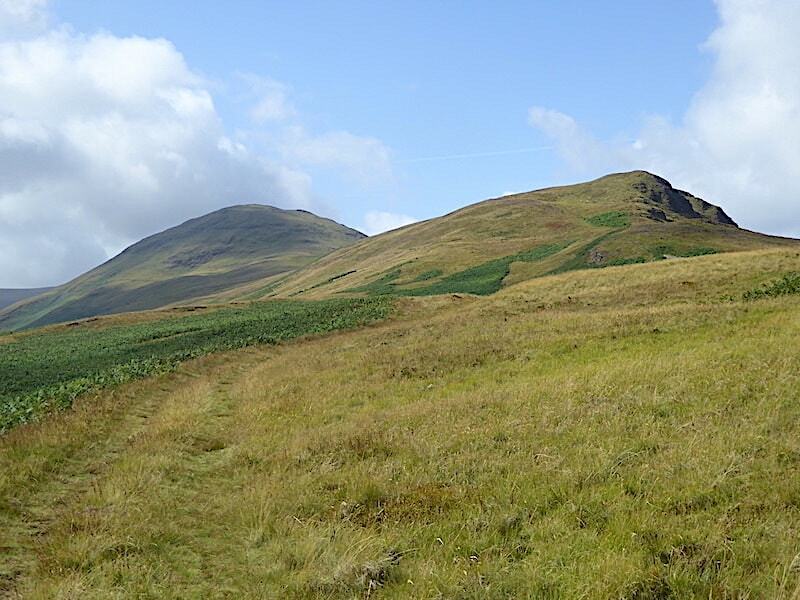 Still following the quad bike track, still in sunshine, and heading over in the direction of Little Dodd. 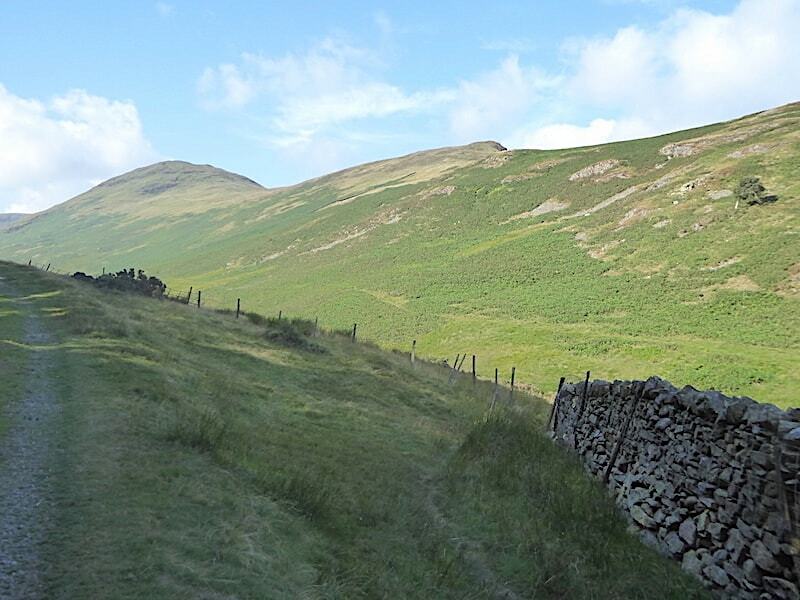 This quad bike track passes below Little Dodd but there is the option to leave it where another path bisects it and then walk up to the stile in the fence, which can be seen at the end of the field line below Low and Darling Fells. 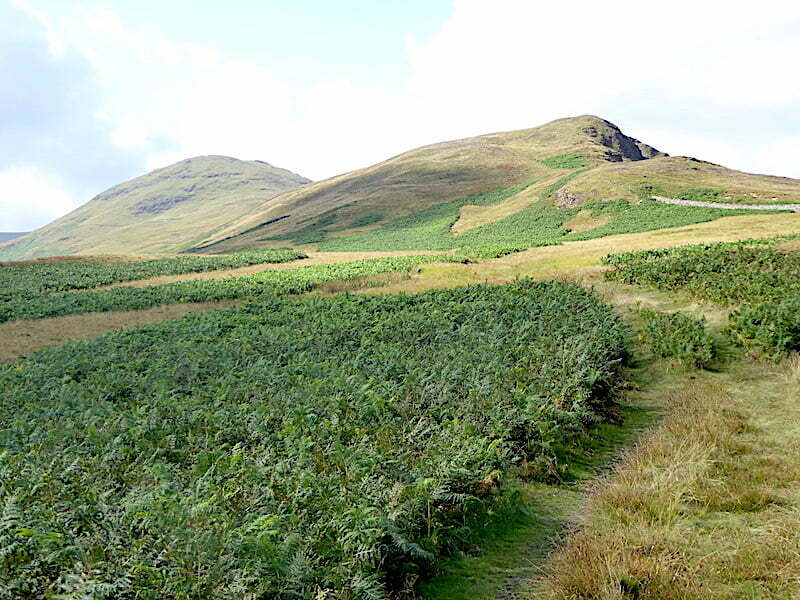 On the other side of the stile is another quad bike track which also passes just below Little Dodd and continues up to the ridge leading over to the summit of Hen Comb. 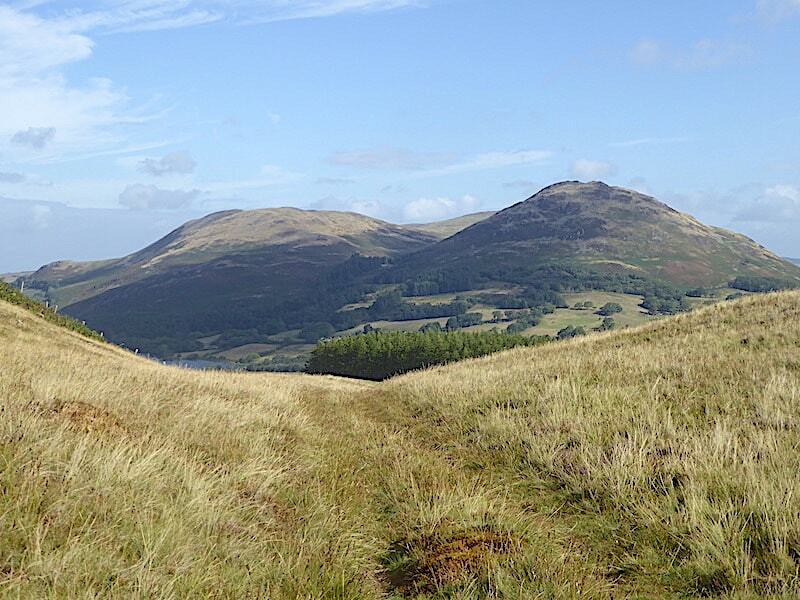 We continue on the path running below Little Dodd as we will be returning via the ridge to take advantage of the views from the descent. 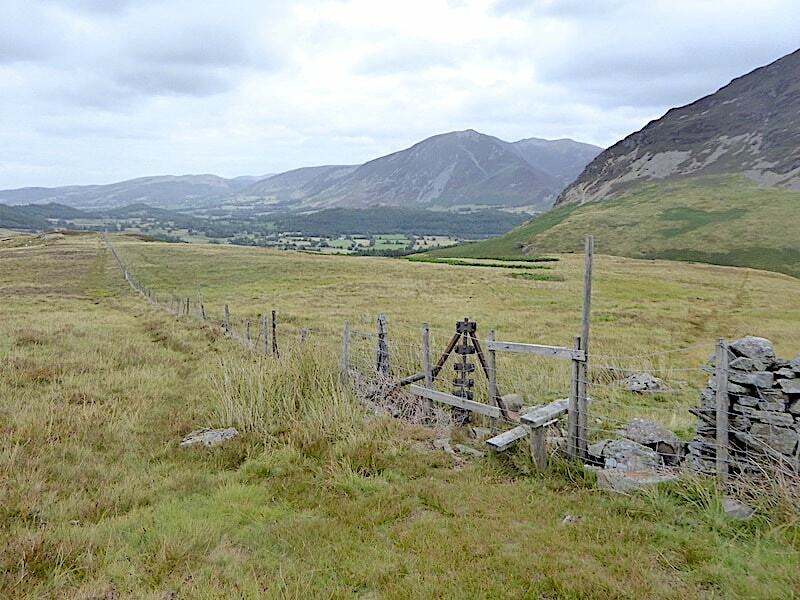 A sheepfold in good repair is below us as we look along Lorton Vale. 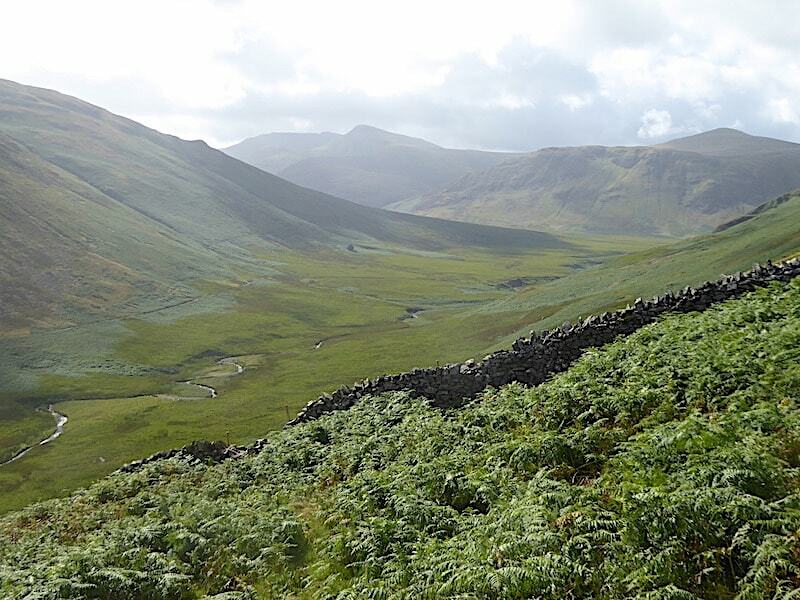 Looking along a sunny Mosedale but dismayed to notice the large grey clouds coming towards us. Its very windy so it won’t be too much longer before they are above us. 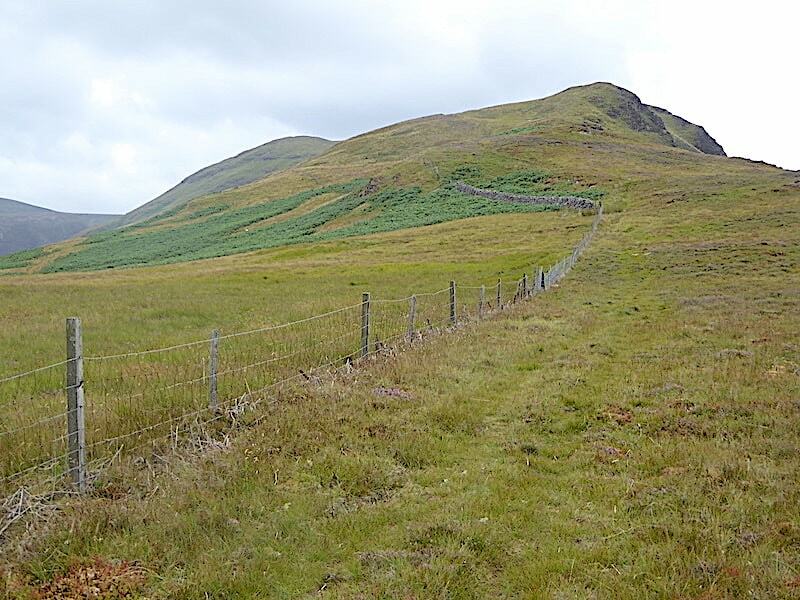 At the wall we turn up towards the fence, cross over it and then take a pathless route across the fellside and up to the ridge line. We used the occasional sheep trod but for the most part it was a bit of a rough trudge through grass, heather and bilberry. 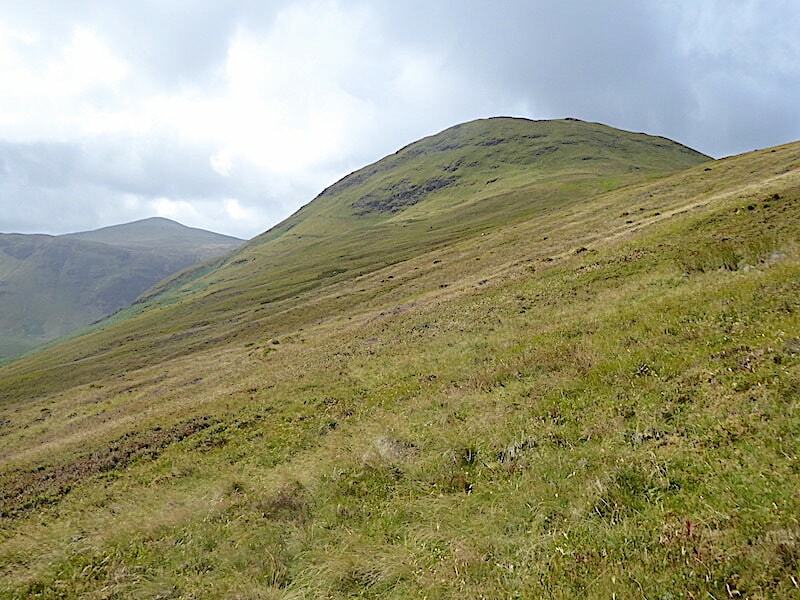 Reaching the ridge line and from the fence, which had no stile or gate but was easily straddled, we take a look up at the climb to Hen Comb summit. The first part isn’t too bad but gradually it becomes steeper and steeper. Looking back along the ridge as we begin the climb. 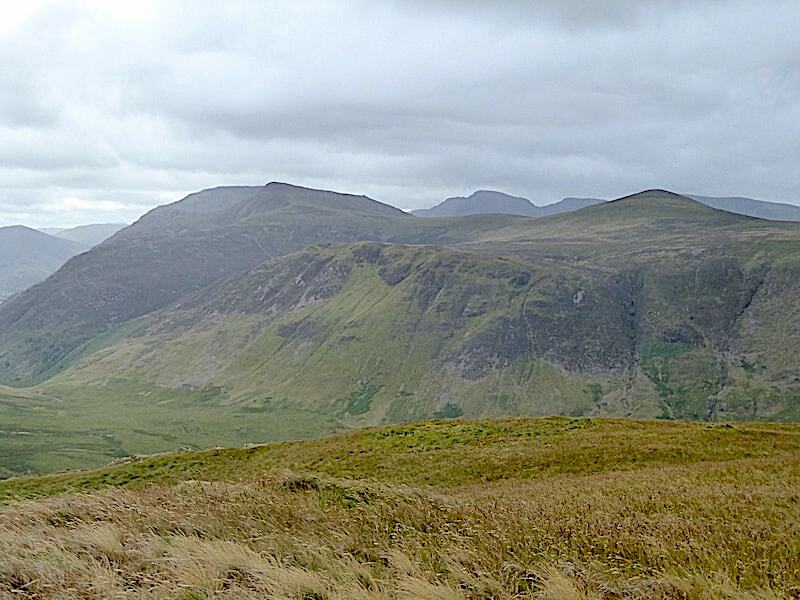 The view across Mosedale to Mellbreak with Grasmoor peeping up behind it. 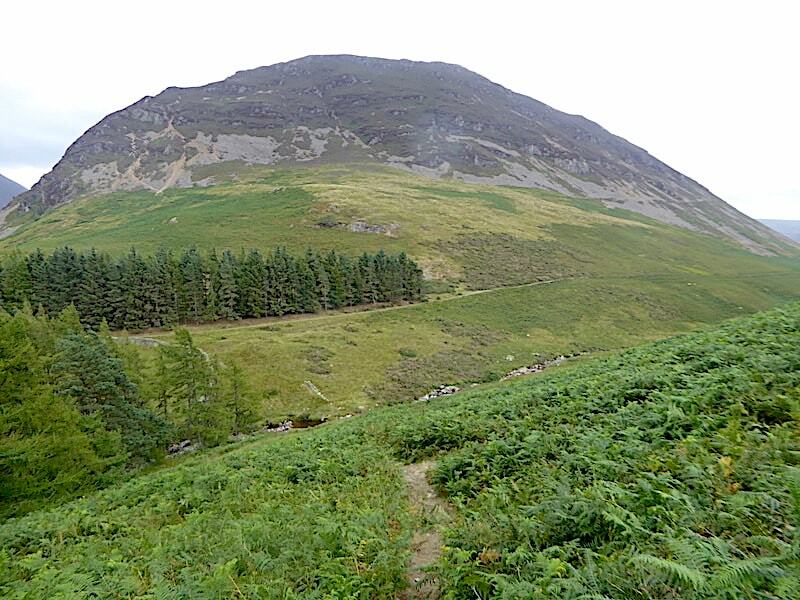 We are being watched from above as we begin the climb up the final section of the steep climb. The wind was very strong up here and was blowing straight at us which made the steepness just that little bit harder to deal with. Fortunately this steeper section doesn’t last very long. Just below the summit we stop to put our windproofs on. Given the strength of the chilly wind up here we didn’t want to wait until we reached the top to try to put them on. 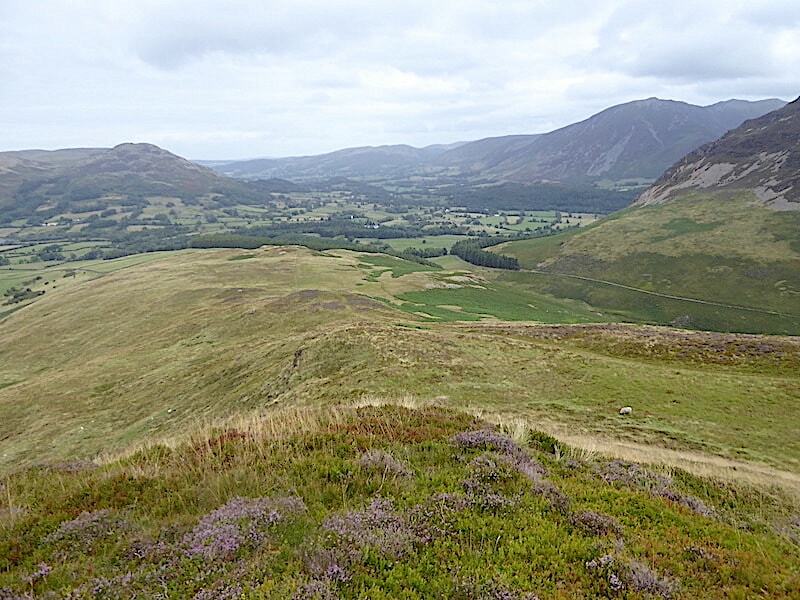 A quick look round while we were here gives us a view of Mellbreak, Grasmoor and a few of the north western fells …. 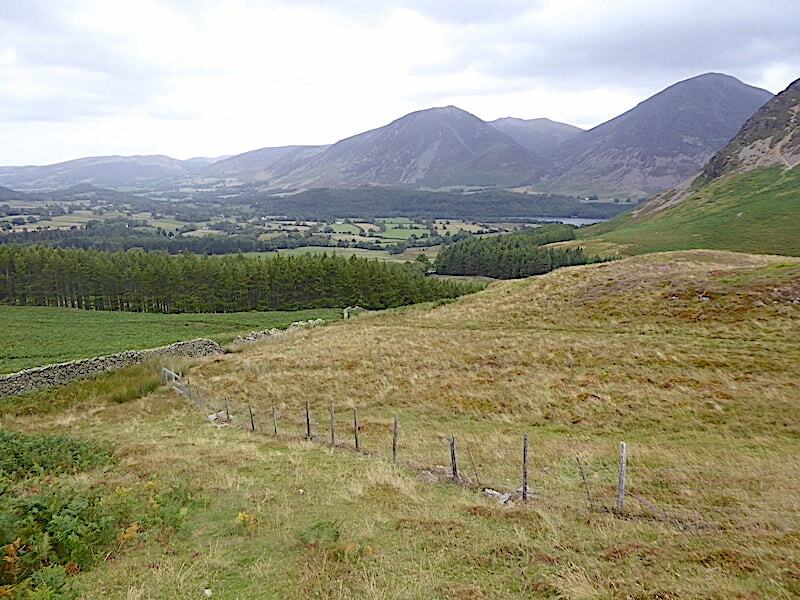 ….. and across Mosedale, a glimpse of Buttermere with Fleetwith Pike at the far end. Up on the summit, and with J acting as a stabiliser against the wind, I manage to get a shot over to Buttermere’s Red Pike and Starling Dodd, with Pillar and Black Crag on the skyline between them. A little further to my right and beyond Starling Dodd are Pillar, Black Crag, Scoat Fell, Haycock, Little Gowder Crag and Caw. 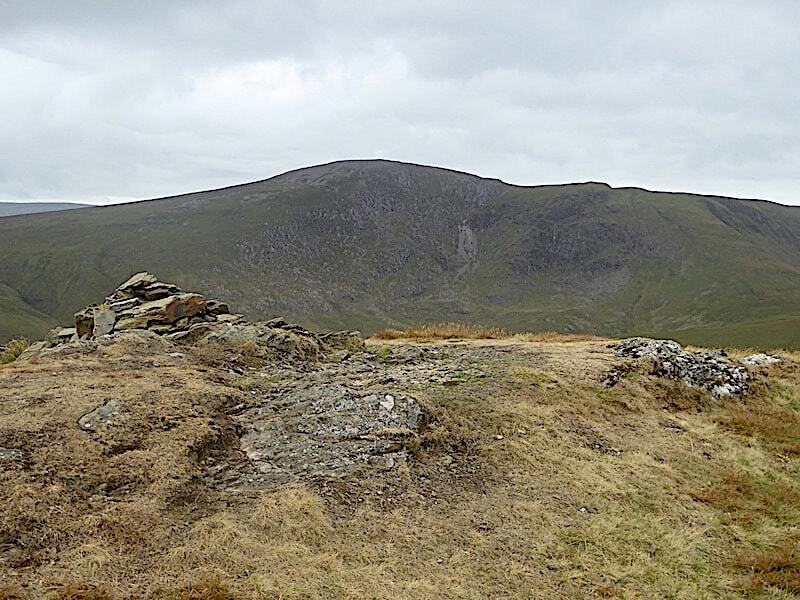 A very dour looking Great Borne beyond the summit cairn. We were fighting against the chilly wind and it was a struggle to stand up so neither of us felt inclined to pose for summit photos. 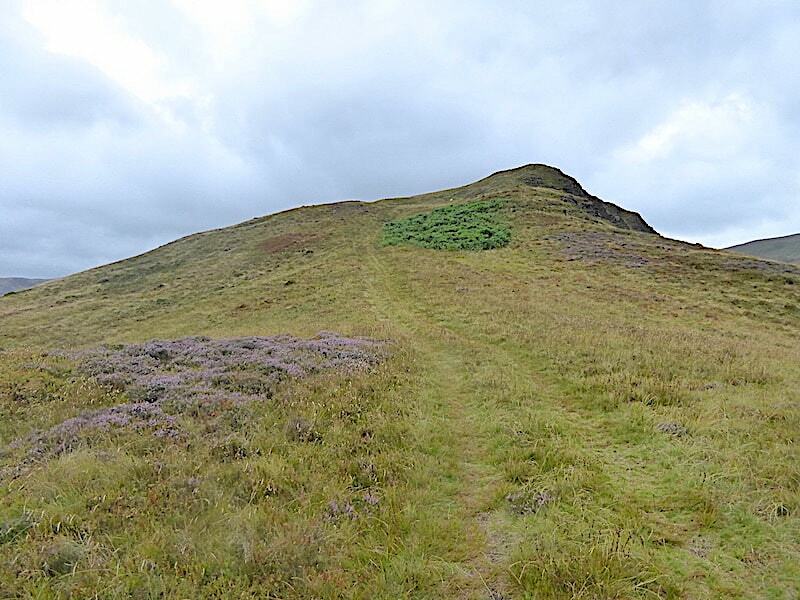 The summit area is simply a small grassy dome with a scrape of bare rock topped by a small cairn. You could become seriously underwhelmed by its paucity of interest. Despite that, the surrounding scenery has plenty of interest, its just a pity that the gloomy light prevented us seeing it at its colourful best. 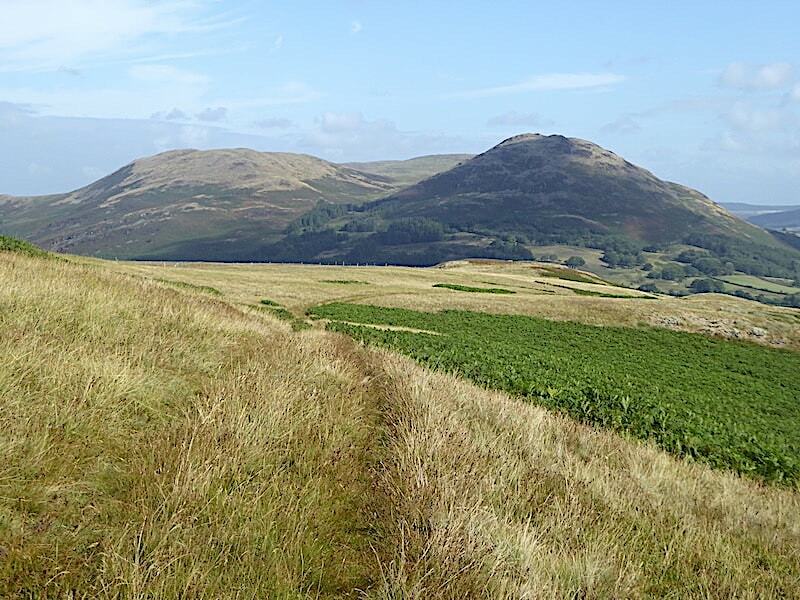 To the west are Gavel Fell and Blake Fell …..
….. and a little further around to the right, Blake Fell together with Carling Knott. 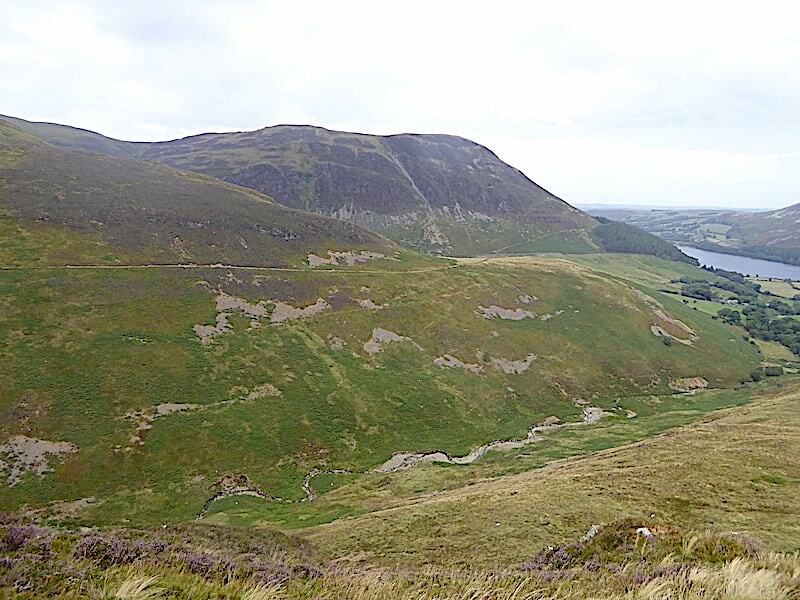 Loweswater from just below the summit as we drop down a little out of the wind. The wind and the cloud cover have lowered the temperature considerably and its now quite chilly. 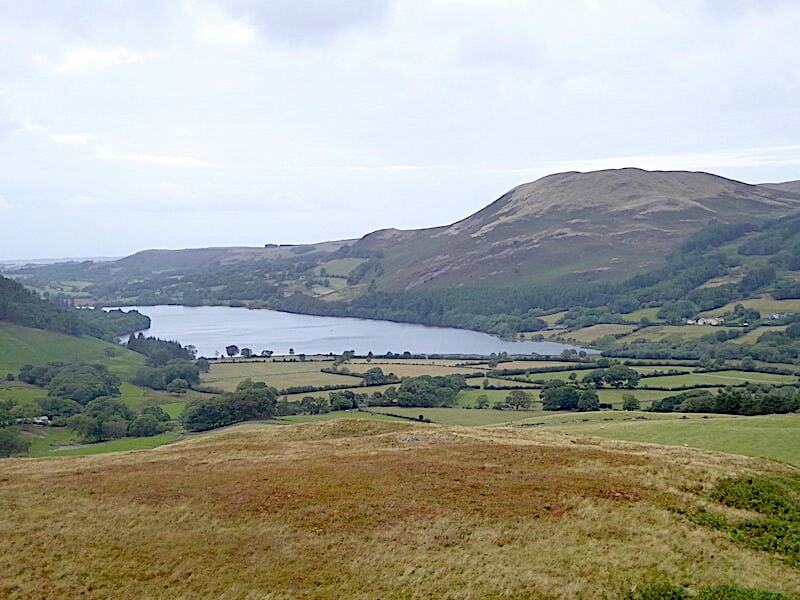 Loweswater and its fells looking decidedly dismal thanks to the flat light. 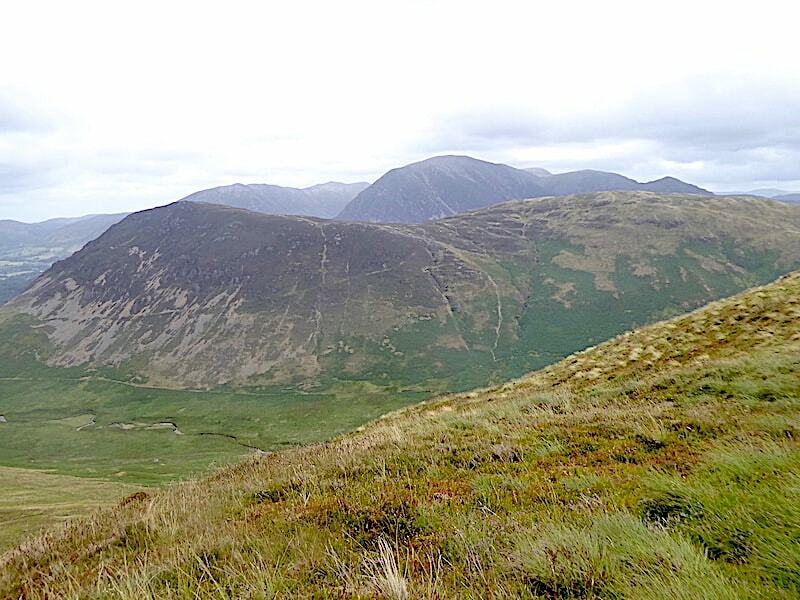 It didn’t take us long to descend since we were more or less blown along by the wind, and it was only a matter of minutes before we were tramping across the heathery ridge and making our way over to Little Dodd. The recent rains have softened the ground just a little, enough to take the edge off the hard, dry ground and for us to feel a slight give beneath our boots, but by no means enough to describe any part of the route as wet or soggy. 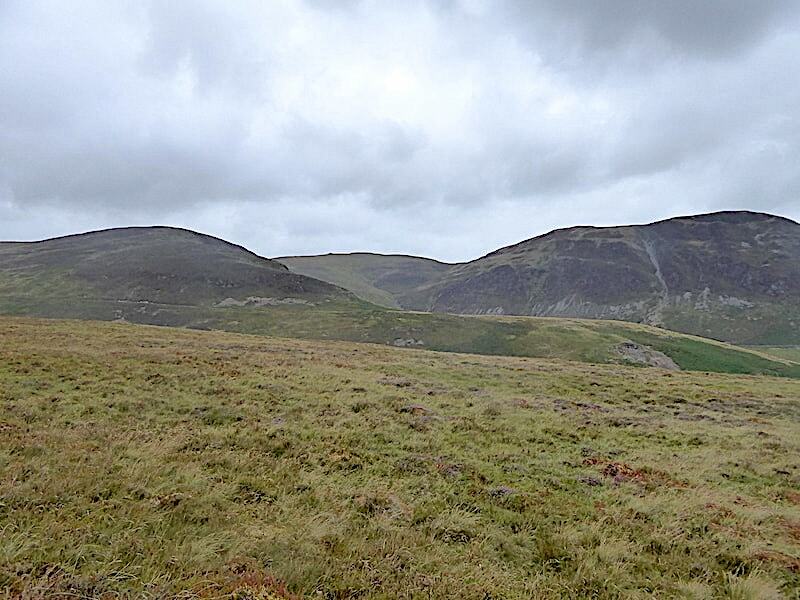 A look back at the summit of Hen Comb, and the looming grey clouds, as we tramp the heathery turf across the ridge. 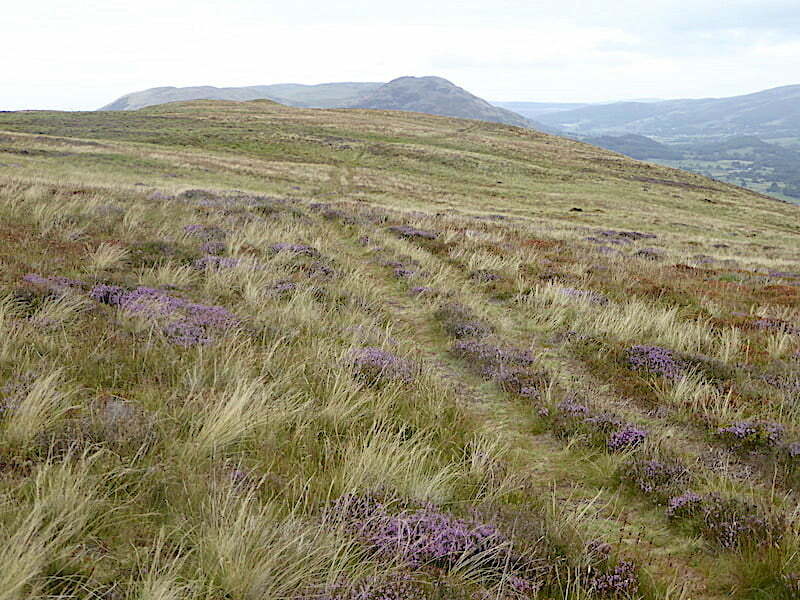 All the heather clad fells are now clothed in a pale lavender haze as the flowers come into bloom. 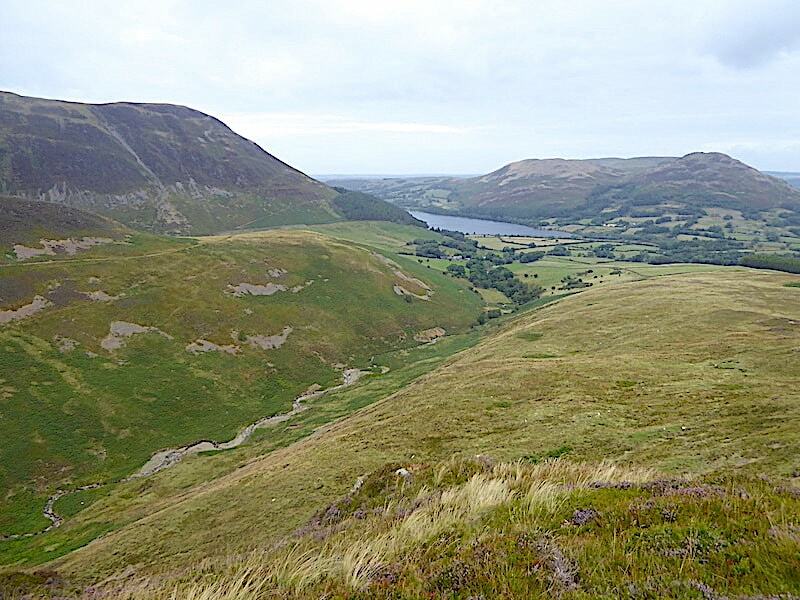 Loweswater and its surrounding fells from Little Dodd …..
….. and a view down to Whiteoak Beck. Mellbreak from Little Dodd. 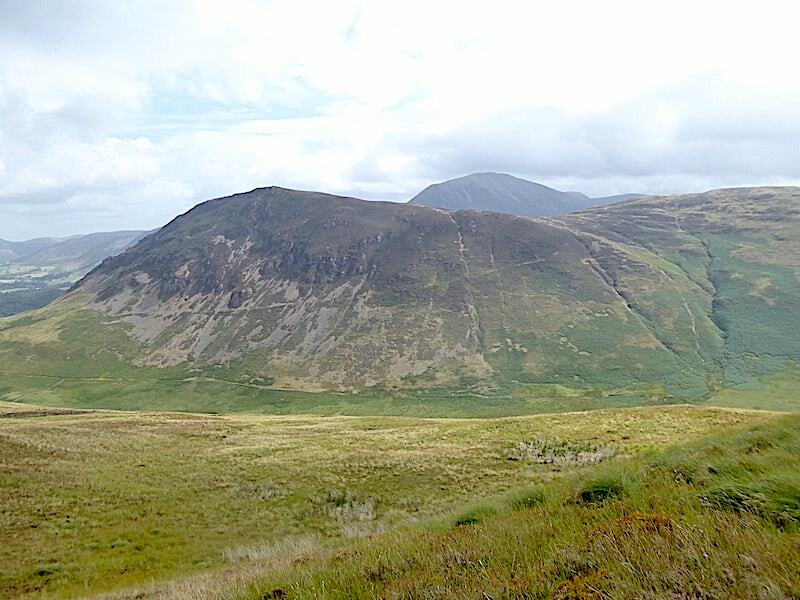 The distinct line across the side of the fell is an alternative path to the depression between the north and south tops of Mellbreak, which avoids the loose, and unpleasant to walk on, steep scree slopes of the north face. From the depression either, or both, of Mellbreak’s tops can be visited. 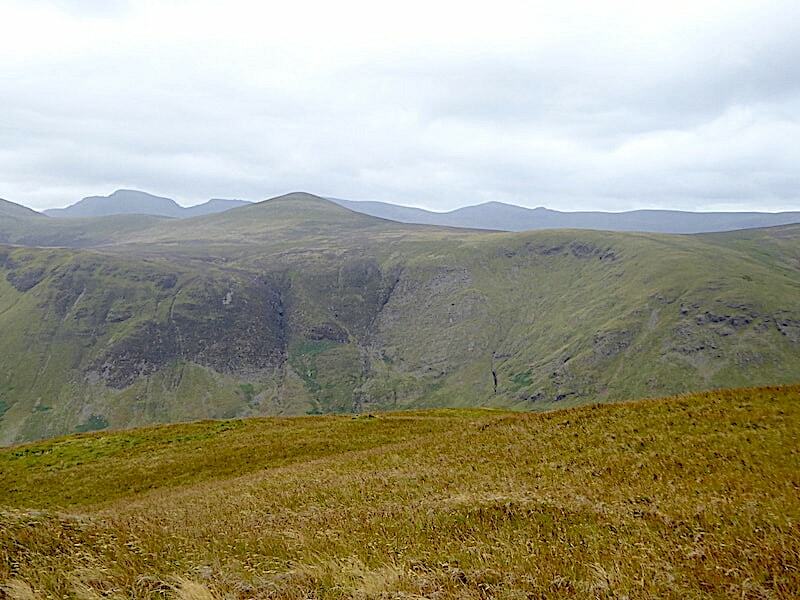 The south top is slightly higher by three metres and the views from both are equally spectacular. 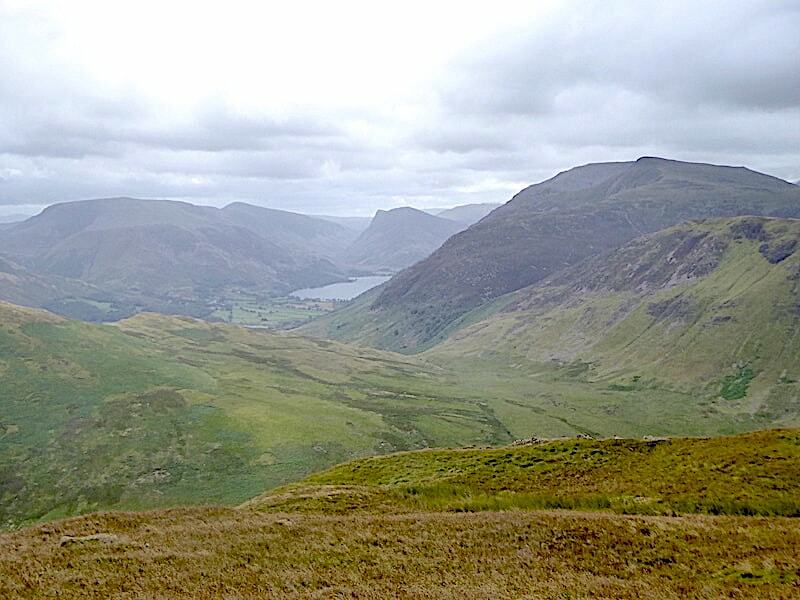 Lorton Vale from Little Dodd. A little splash of sunlight would have greatly improved the view. 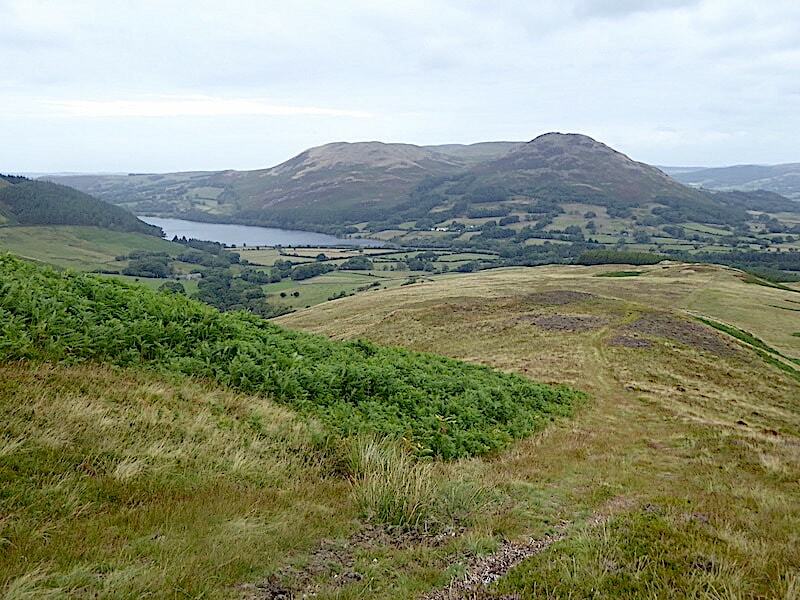 An easy and gentle descent as we drop down from Little Dodd …..
….. from where I took a look back up to it. The stile crossing in the fence I mentioned earlier. Trace back along the path on the other side of the fence and the quad bike track we followed on the outward route can be seen crossing it. We remained on this side of the fence and followed it all the way to the end. 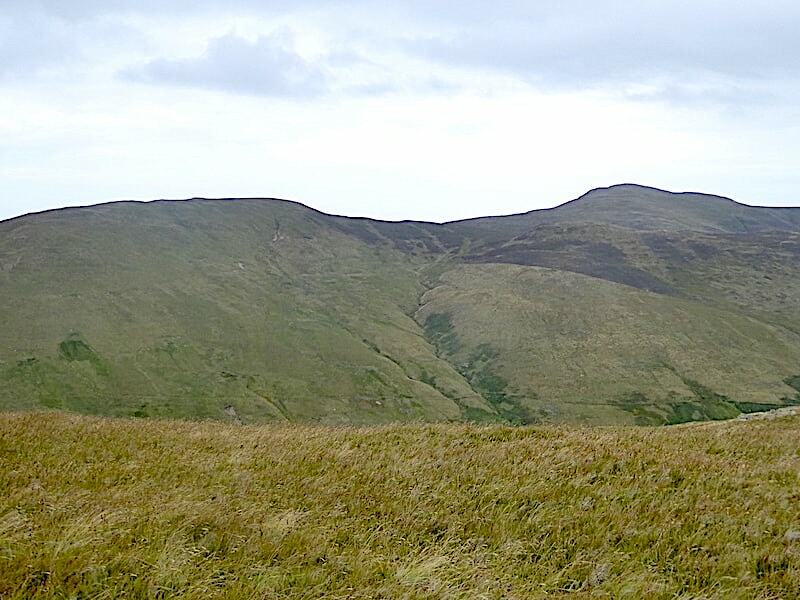 A look back up at Little Dodd with Hen Comb’s summit just behind it. The stile is located where the fence meets up with the wall. 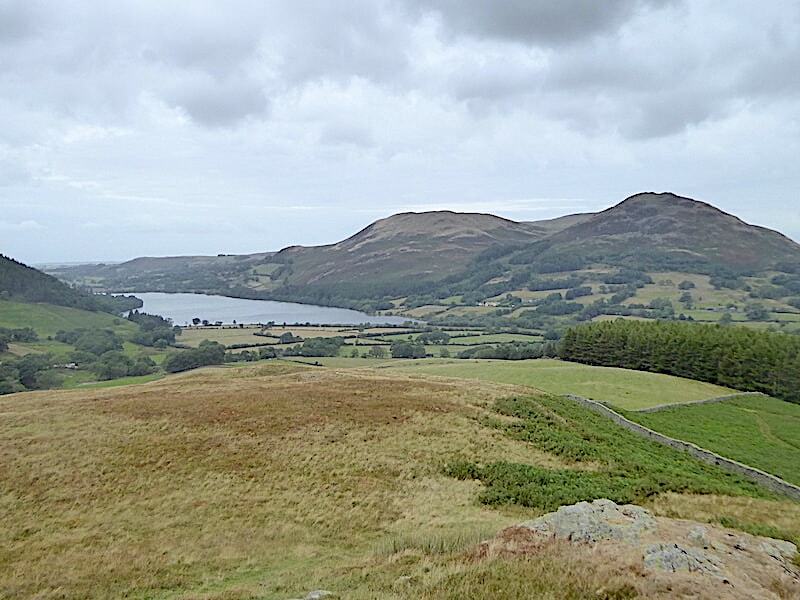 The skies turn even more leaden as we continue down giving us a very gloomy view of Black Crag, Blake Fell and Carling Knott over to our left. This change of weather is taking some getting used to. 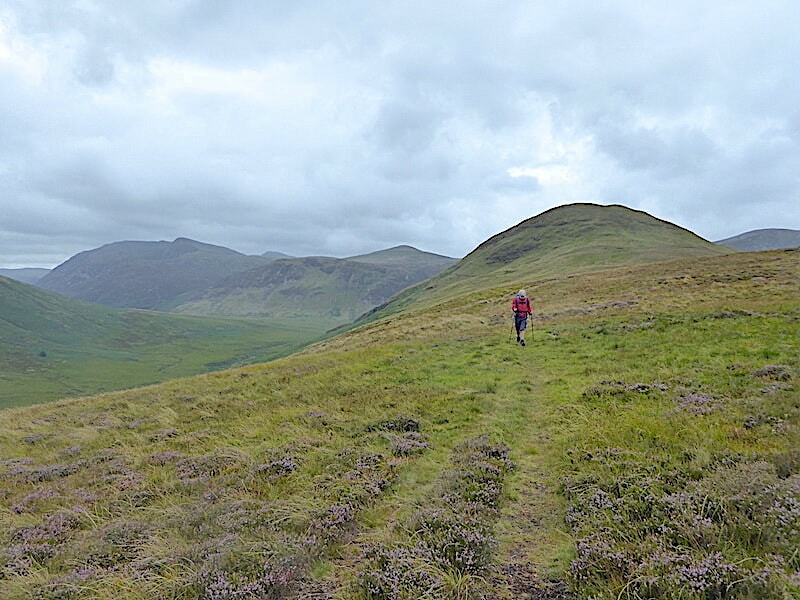 Cool, overcast and windy are often the hallmarks of our British summers and we’ve had many a walk in conditions like this without thinking it at all unusual. Now, after weeks and weeks of sunshine and high temperatures, it feels quite strange to be experiencing them once again. The summer has definitely gone somewhere else, for the time being at least. 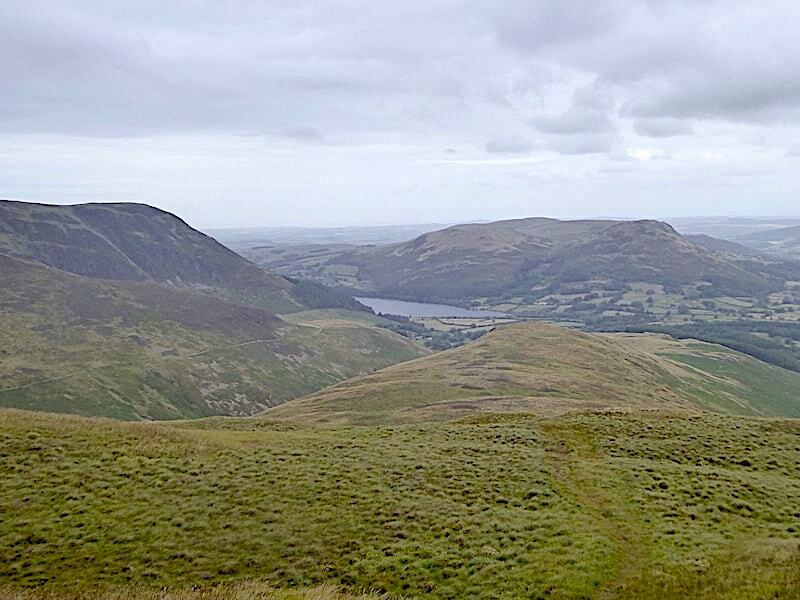 Almost down now and Loweswater and Low Fell come closer into view. The fence ends at the wall and although there’s no gate or stile there is a section of wooden fence at the end which is easily crossed. Just above the fence line is the quad bike track we followed at the start of the walk. 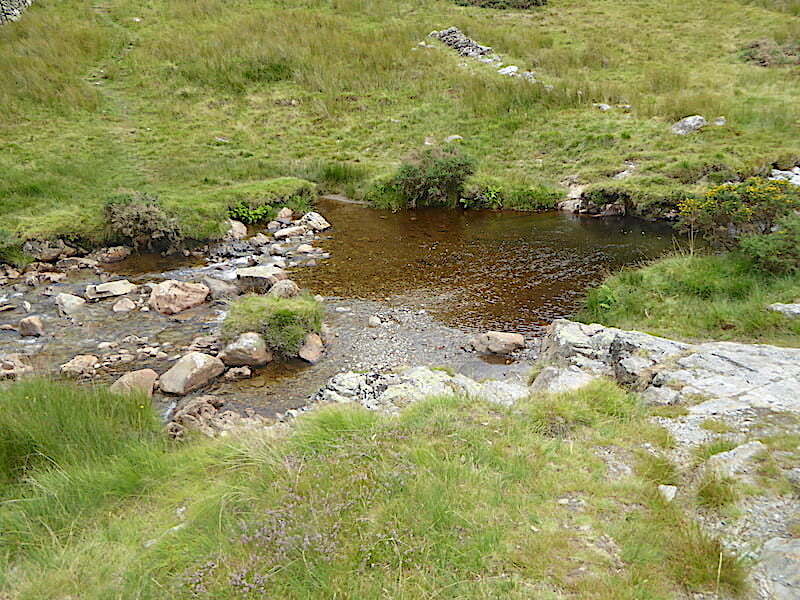 We cross over and follow the path back down to …..
….. the crossing over Mosedale Beck. 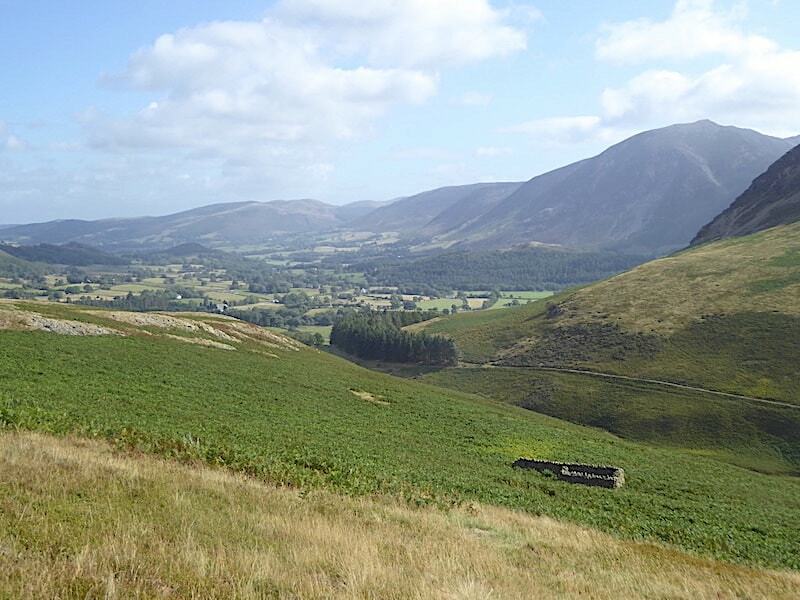 Across the valley the steep scree slopes of Mellbreak are clearly visible. Back down to the crossing point where once again we manage to avoid getting wet boots. It can be tricky to cross sometimes and after last weekend’s heavy rain we did wonder just how full the beck would be. 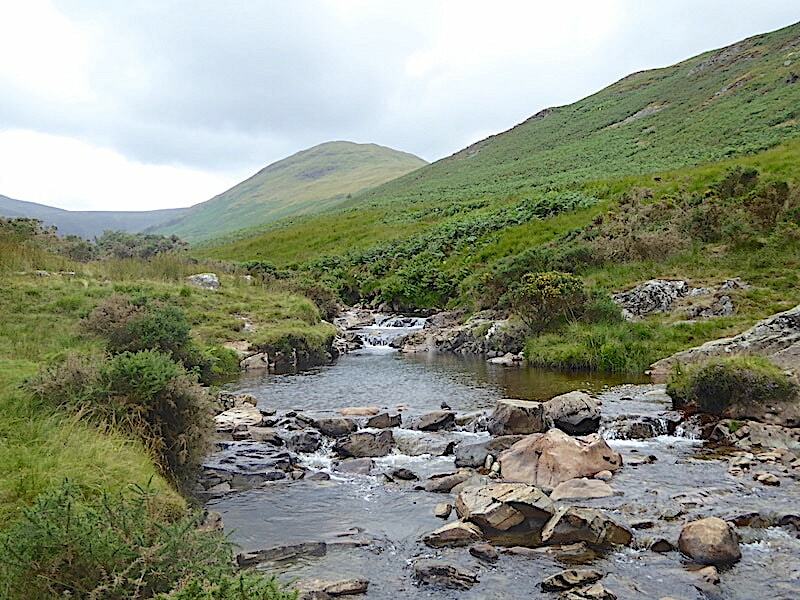 Safely across without incident and a look back along the beck’s lovely little cascades for a view of Hen Comb before we leave. From the top of the little rise out of the beck a look back at the crossing and the steepish slope eventually leading up to the quad bike path. 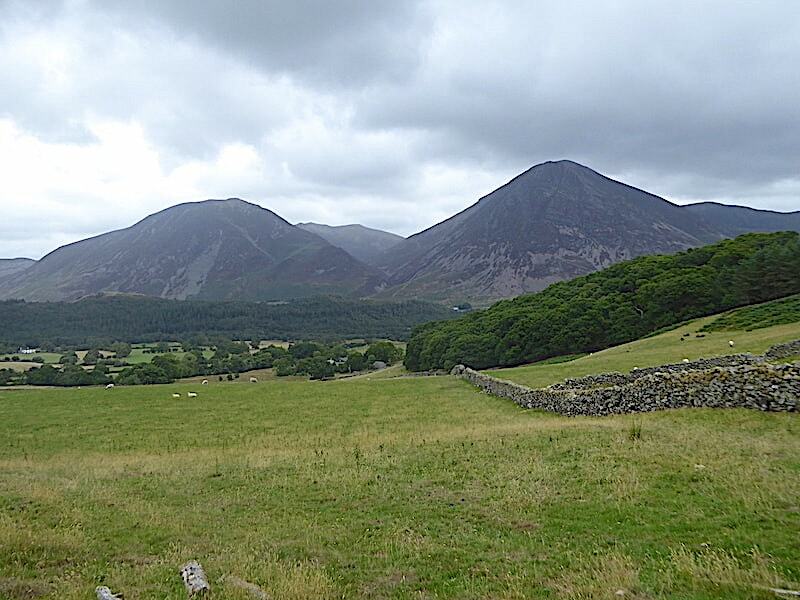 Whiteside and Grasmoor in sombre mood as we walk the farm track back to the car. 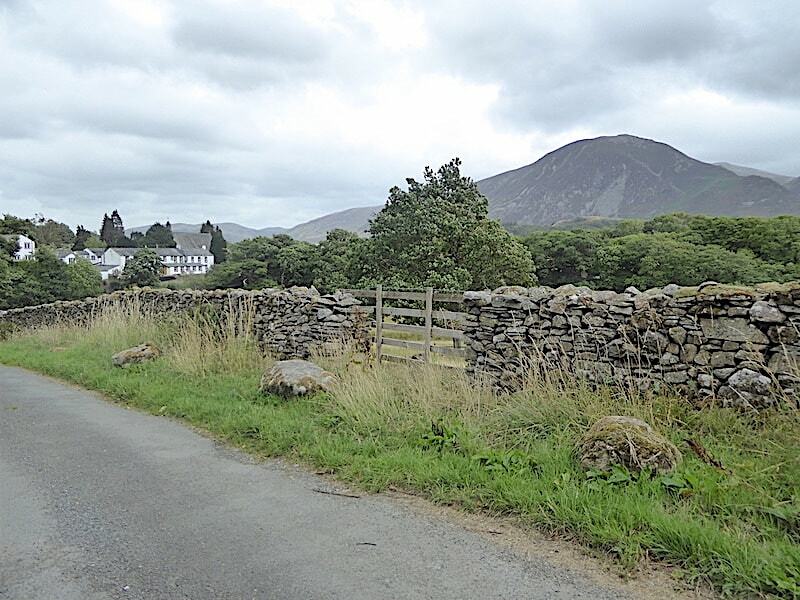 The Kirkstile Inn appears and we are almost at the end of today’s walk. Just a little further back up the lane from this point we had met a family making their way up. Mum, with two very young children and accompanied by another adult female, was a little way ahead of Dad, who was toting a baby in baby carrier/rucksack, on his back. As he came towards me Dad asked me, out of earshot of the rest of the group, if they were on the right path for Mellbreak, yes they were, and if it was as rocky as it looked. What to say? 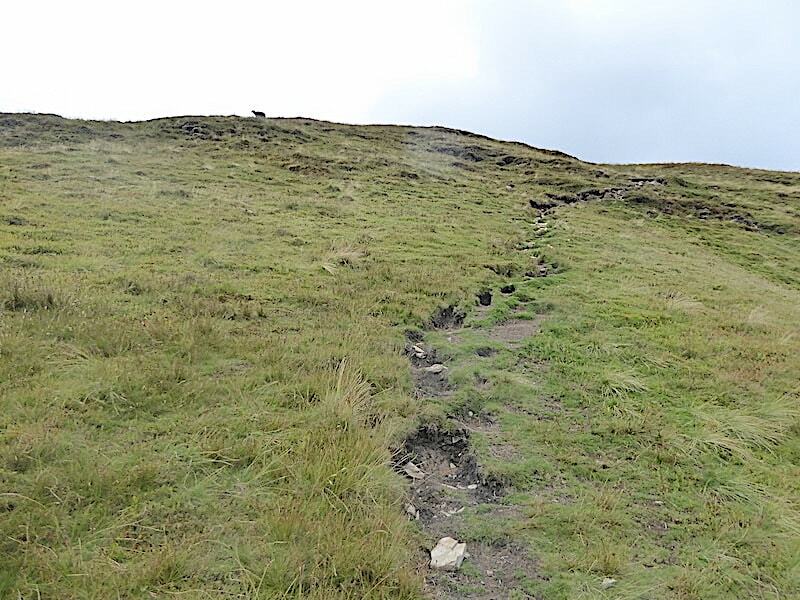 I didn’t want to say anything alarmist so compromised by replying that there was a path up through the crags to the top but the initial sections were steep with loose scree slopes. He glanced down at the small scale gravel on the track we were on and asked if it was like that. 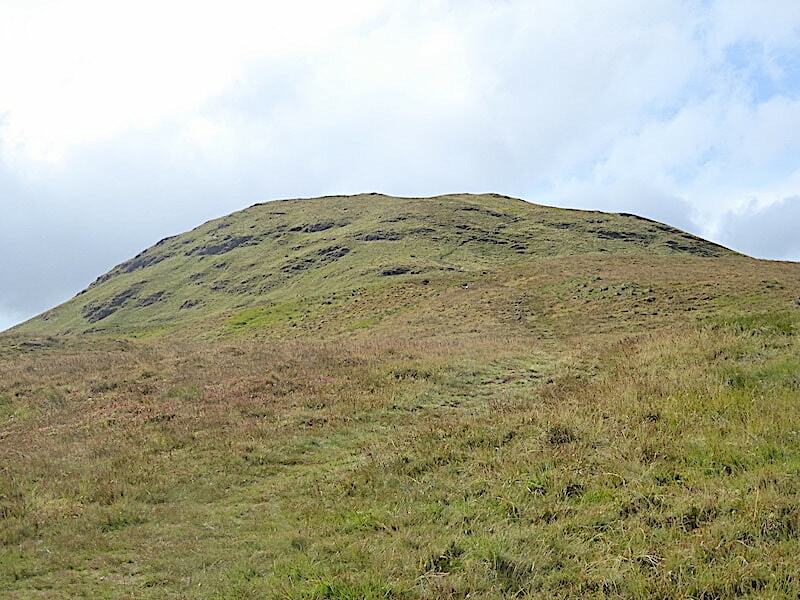 No point in being other than truthful now, considering there were two young children walking in the group, so I felt bound to say that it was rougher and looser than what we were standing on so it can be a laborious climb and that some slithering could be possible. With that he thanked me and we parted company. Its always difficult to know how to respond when there are very young children in a group, you don’t want to put people off but neither do you want to give a false impression and potentially put them in harm’s way. I wouldn’t consider following that route with two youngsters, one of whom seemed to be about six or seven and the other probably less than school age, never mind attempting it with a baby strapped to my back. J was of the opinion that Dad was already having doubts and that once the foot of the scree slope was reached the walk wouldn’t go ahead. Whatever decision they came to I hope they had a safe and happy day out, wherever they went. As for us, it was back to the car and the drive back home. Its just turned noon so its only been a short morning walk and it was just a pity that the sunny weather couldn’t have lasted just that little bit longer. 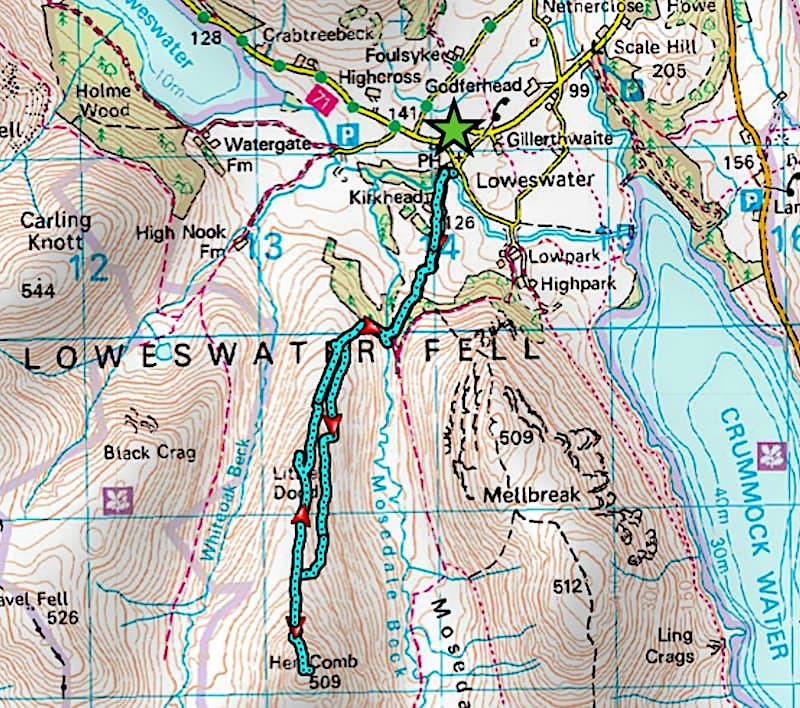 An easy enough walk but best done in brighter weather to get the most out of the views.